To the average Fox News viewer, American Secretary of State Mike Pompeo’s assertion last month that Hezbollah has “active cells” in Venezuela was likely shocking or worrying, or it confirmed their fears that all of America’s enemies have assembled, ready to strike at the heart of the Western world. Instead of pressing him on his statement, interviewer Trish Regan entertained Pompeo’s unsubstantiated claim and reported his comments as an “exclusive confirmation.” Allegations about Hezbollah in Venezuela have been circling for a long time, but Pompeo’s assertion of actual militant activity is an escalation of rhetoric at a time when the United States is trying to delegitimize the Venezuelan government and push their ongoing coup attempt. They also come at a time when the US and its allies are attempting to undermine Hezbollah’s role as an actor in Lebanese politics. The US, Israel, and their allies consider the group a terrorist organization that Iran (its benefactor) uses to threaten Israel. Hezbollah’s growing influence in Lebanon and the wider region threaten American interests, which the US is deeply invested in bringing a halt to. The three men Boyd singles out as recipients of Venezuelan IDs are Ayman Saied Joumaa, Abbas Hussein Harb, and Kassem Mohamed Saleh. Joumaa is a Colombian/Lebanese national and alleged drug kingpin who was a central target of a 2012 effort by the US Treasury to combat Hezbollah’s drug trafficking operation in Latin America. The Treasury designated Harb and Saleh as associates and collaborators of Joumaa and targeted them with sanctions as well. While Hezbollah’s purported connections to Latin American drug smuggling cannot be dismissed outright, anything the State Department or Treasury says about them or Venezuela should be taken with caution. Allegations about Hezbollah’s global activities range from the reasonable assertions of Hezbollah’s drug trafficking operations in Latin America, to the entirely unproven, like Pompeo’s statement, or former FBI analyst Matthew Levitt’s unfounded accusation that Hezbollah is running drugs in London. Claims about the organization’s activities are often made without evidence and reported at face value by media outlets because these claims are shocking to the uncritical reader (e.g. Hezbollah in the West End!). They can help to create an atmosphere of hysteria about imagined terrorists and, sadly, of xenophobia towards Lebanese and other Arab or Muslim communities that are often caught up in Hezbollah conspiracy theories. While actual tensions towards Lebanese and other Arab populations in Latin America are generally quite low, this is despite efforts of members of the Western commentariat and intelligence communities, who regularly deploy xenophobic rhetoric in an attempt to stir up distrust and suspicion. In a 2014 Wall Street Journal opinion column discussing El Aissami, Mary O’Grady, one of WSJ’s prominent Latin American commentators, writes that the then-Governor of Aragua is working “on behalf of radical Islam”, and relays the claim by analyst Joseph Humire that Iran is infiltrating Latin America, writing “The earliest stages of the process have featured clandestine operatives using mosques to make connections inside Muslim communities and then using those connections to access wealth and gain political prominence.” She makes reference to “Islamic intervention” and mentions El Aissami’s “Muslim father” (his father was Druze). Nicholas Kozloff, writing for Huffington Post, cites American consular officials as saying “While the majority of Brazil’s Muslims are moderate in orientation and the overwhelming majority is moderate in deed and action, genuine radical elements do exist here, some in the Tri-Border area of Foz de Iguacu and others among São Paulo’s estimated 20,000-strong, Hezbollah-oriented Shia population. Muslims at the moderate, Sunni-oriented Future Institute charge that Shia immigrants sometimes come to Brazil with Hezbollah support to found businesses to support Hezbollah in Lebanon.” This kind of language will be recognizable to anyone familiar with the Islamophobic fearmongering common in American discourse. It doesn’t matter that there’s no significant Islamic fundamentalist activity in Latin America—these words aren’t meant for the ears of people there. They’re meant for Western audiences, to stir up fear and convince them, as Pompeo attempts to convey on Fox, that there are hordes of Hezbollah militants on America’s doorstep, ready to attack (presumably alongside the ISIS members in the migrant caravan). 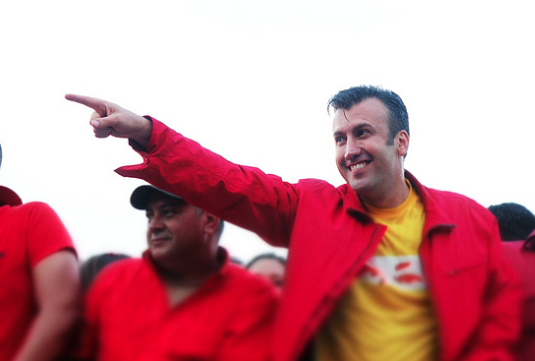 One of the more questionable allegations regarding Hezbollah’s operations in Venezuela came in January, when Americo De Grazia, an opposition MP, claimed that the group is operating two gold mines in Venezuela, allegedly stealing all the profits in collaboration with the government. While this assertion was presented without evidence, Gulf state mouthpieces like Asharq Al-Awsat, Al Arabiya, and Gulf Daily News reported the statement, eager to get a dig in at Iran. The story was also picked up by the Clarion Project, a right-wing outlet with a history of Islamophobia, in a piece that echoes some of the alarmist tropes seen above. 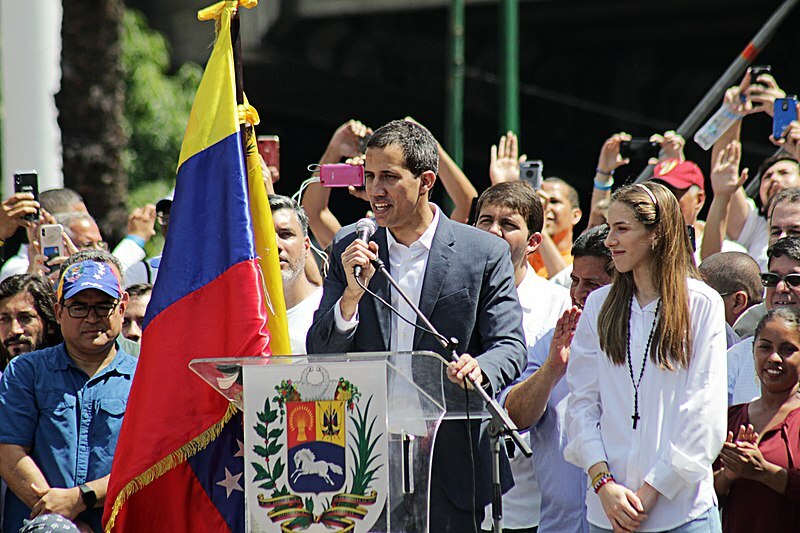 Juan Guaido, who has been recognized by the United States and most Latin American countries as Venezuela’s “interim president,” addresses an anti-government crowd. 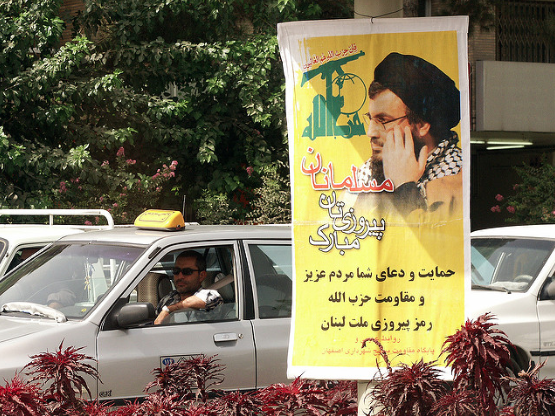 The latest panic around Hezbollah comes at an interesting time for Lebanon. 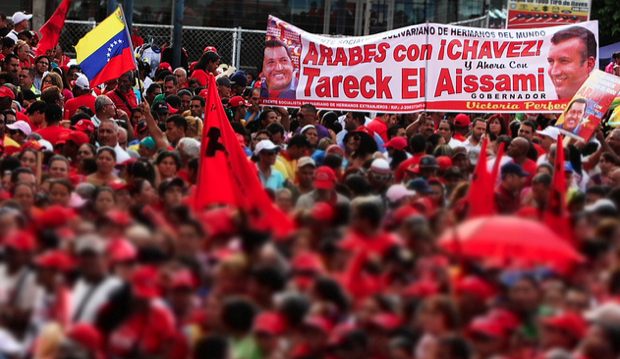 On January 31st, the country finally formed a government after months of gridlock. Notable among the new cabinet members is Jamil Jabak, the Hezbollah-selected Minister of Health. While not a member of Hezbollah himself, he is one of the ministers appointed as part of their share, and will likely be quite close to the party. Hezbollah’s detractors have raised concerns about their control of the Health Ministry in particular. The State Department issued a statement cautioning the party against using the ministry to provide material benefit to their organization, though this was downplayed by Prime Minister Saad Hariri, who stated “A minister is a minister for all of Lebanon and all the Lebanese people, and the health minister said this after taking over the ministry.” This sentiment was echoed by Hezbollah Secretary-General Hassan Nasrallah. Whether or not this will be the case is unclear. While Hariri is certainly no friend to Hezbollah, he has to make these statements out of the necessity of political etiquette, especially considering he’s just gone into government with them. Lebanon’s political system is highly clientelist, and nearly every political party uses ministries to provide for their base and win votes. Ironically enough, this has generally not been Hezbollah’s focus in the past, as it is able to secure other means of funding to drive its social service network, and as such has previously played a downsized role in cabinet. Should they elect to change their ways and use the Health Ministry to their benefit, they would simply be playing the game of Lebanese politics. With America’s warning, however, it would likely be unwise for them to pursue that kind of strategy given the large amount of foreign funding that goes towards health. 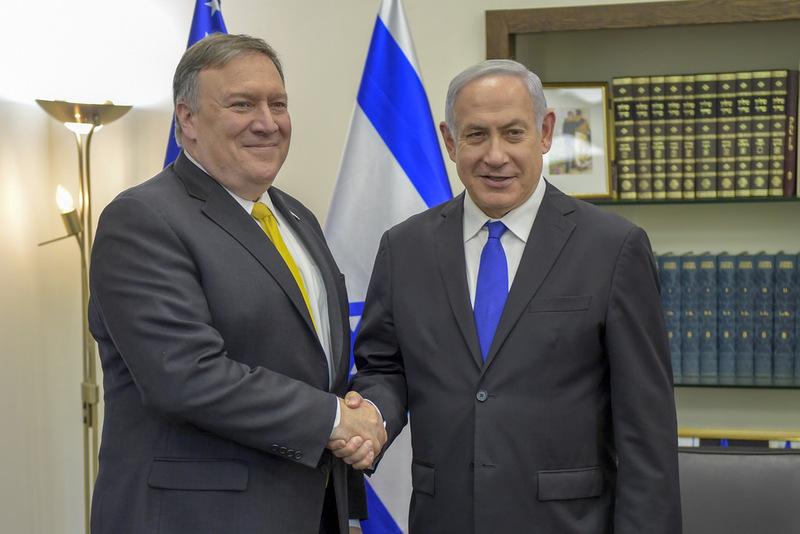 Mike Pompeo with Israeli Prime Minister Benjamin Netanyahu. This rhetoric also serves to bolster the Trump administration’s Middle East policy. Trusting that the public will lump everyone they’re told is an “Islamic terrorist” together, the US government can create a boogeyman in the form of “active Hezbollah cells,” presumably ready to launch an attack on American soil, as Pompeo insinuates and as Republican Senators have explicitly warned of. Never mind that there is little to indicate Hezbollah has any interest in doing that, this rhetorical strategy plays on the public’s fears and the eagerness of many media outlets to go along with a State Department agenda that delegitimizes the geopolitical opponents of the United States and pushes regime change. Whether or not the rhetoric will work right now is questionable—Maduro is in a fairly strong position right now—but there’s a slim chance it will stop any time soon.